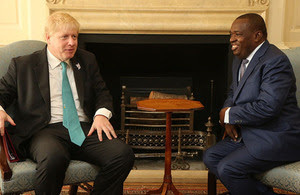 In the margins of CHOGM Foreign Secretary Boris Johnson welcomed his Zimbabwean counterpart Foreign (and Trade) Minister Sibusiso Moyo to London for a roundtable with other international partners. The historic meeting ushers in a new era in UK-Zimbabwe relations and symbolises Zimbabwe’s commitment to engaging meaningfully with the international community. President Mnangagwa has been in power for 150 days and while Zimbabwe has made impressive progress, there’s still much to do. That’s why Britain, the Commonwealth and the wider international community will do everything it can in supporting Zimbabwe on its path of reform. But we must remember democracies are not made in a day. July’s election will be a bellwether for the direction of a new Zimbabwe. The Zimbabwe Government must deliver the free and fair elections the people of Zimbabwe deserve and which it has promised. The UK stands ready in friendship to support a Zimbabwe that fully embraces the rule of law, human rights and economic reform. There is a great deal of interest in Zimbabwe applying to rejoin the Commonwealth after their election in July. Applying is a matter for the Zimbabwean people to decide. Zimbabwe would have to formally apply to the Commonwealth Secretariat and the final decision would then be for all Commonwealth members. However, the UK would strongly support Zimbabwe’s re-entry and a new Zimbabwe that is committed to political and economic reform that works for all its people. Today’s meeting reinstated the commitment of the British government to the people of Zimbabwe. The UK currently provides £91m in bilateral UK aid to the people of Zimbabwe in 2017/18. This includes the further £5 million the Minister for Africa, Harriett Baldwin announced to support free and fair elections during her visit in February.